Well apparently, the ground hog lied. However in the past few days it’s been nice to see the temperature hit the double digits… on the positive side. Can’t wait to get the 442 out for a spin and to a few car shows before our club meet in July. 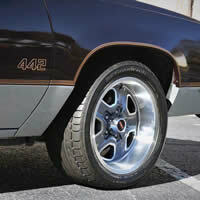 In the market for some 17” Super Stock II wheels? A little Oldsmobile bird told me that these wheels will be available in June 2019 from Year One. According to Jeff Flowers “ They haven’t released the price yet. We just received our first set of test wheels. Most of the 17 inch wheel sets are in the $1100-$1200 range and include center caps and lug nuts”. He says that the wheels will nor rub and that they will fit 68-72, 73-77, and 80’s cars. There is also a website that you can visit to see if you like different wheels on your car. If you are a member on our Facebook page, you would have seen this already. I had a picture of my car at almost the perfect angle and used it to see how I would like certain wheels. The name of the site is Wheel Visualizer. This is what my car looked like when I changed out my 15” SSII’s for a few different wheel styles. The best part? I didn’t have to turn a tire iron or jack up the car. It was all done on the computer. And it turns out that I really like my SSII’s. Edmonton Area A&W Cruise Nights: A&W has offered their A&W card to members in the Edmonton area who cruise on Friday and Saturday nights. The card entitles the member to two Teen Burger meals (two burgers, two fries and two drinks) for the price of one. You will also receive a free meal for the cruise in on May 17 & 18. See our Facebook page for more info. I asked if they had a program like this for our members in the Calgary area and was told "no". I'll be emailing members to come over to my place in April when I get them. Some of you haven't picked up your cards for the last three years, so this year I didn't order one for you. If this is you, and this year you’ve decided that you do want one, call me and I’ll see what can be done. Well, if you didn’t see it on our Facebook page, March 22 was the 40th anniversary of me buying my 442 in 1979. I was living in Calgary at the time and saw the car for sale in the auto section of the Calgary Herald. I went to see the car. A few other people had seen the car before me and decided not to buy it because it had the 455 engine. So I bought it. I asked the owner, “What are you asking for it?” He said “$5000”. So I used my best negotiation technique that I had learned up to that point (4 years out of high school). I looked him straight in the eye and knew I had him right where he wanted me. So, I countered with definate “OK”. Oh well, I never thought I’d have her 40 years. I’m glad I was so shrewd. Are you signed up for our annual meet in Olds? It’s looking like it will be a good show. Remember, the faster you register, the faster you pick a door prize or an envelope with money in it. Will someone win the $100 this year? Hope to see you at the Rocket Round Up in Olds.